Our kidneys carry out the complex system of filtration in our bodies - excess waste and fluid material are removed from the blood and excreted from the body. Our kidneys get their blood and oxygen supply from the renal arteries, which are branches of the abdominal aorta (another artery). 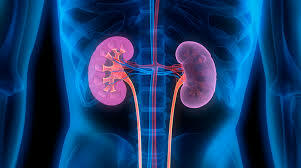 When it enters the kidneys, blood goes through smaller and smaller blood vessels - the smallest ones being the glomeruli (tiny capillary blood vessels which are arranged in tufts). It is in the glomeruli that blood is filtered - waste, fluids and other substances are extracted and cross in to miniscule tubules, from which the bloodstream reabsorbs what the body is able to reuse. What the body cannot reuse - waste - is excreted in our urine. In most cases our kidneys are able to eliminate all waste materials that our body produces. However, if the blood flow to the kidneys is affected, of the tubules or glomeruli are not working properly because of damage or disease, or if urine outflow is obstructed, problems can occur.